Economic situations have made it necessary for more people to buy used cars, which, in turn, has raised the prices considerably. Good deals on used autos can still be found, though, but you will need to be prepared to talk to a dealer in order to get the best price on a used car. If you have a particular model in mind, you can start your search for your ideal pre-owned car by going online and finding out what kind of prices it is going for. You also want to see what the prices are in your area, because this may change from one area to the next. Kiplinger.com mentions that a used car that has been on the lot for more than 30 days will often have a price drop to make it sell faster. 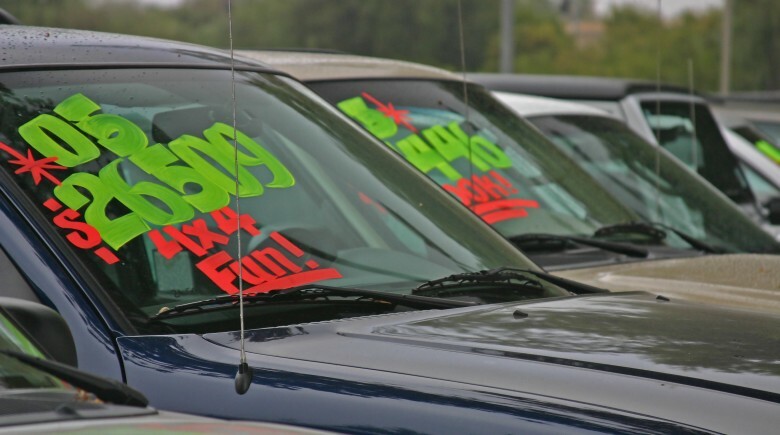 This means that you may want to check more than once for used car prices in your area. It may be easier to get financing from the dealer where you purchase your car, but you can get a better deal if you get a pre-approved auto loan first, says Edmunds.com. Getting pre-approved does not mean that you have to take the loan, but having a blank check in hand will enable you to have better bargaining power. After you find the car you want, you can use the check and interest rate to find out if the car dealer is willing to give you an even better deal. The check, which will be mailed to you, is usually good for up to 30 days. If it is not used, you are not obligated for it. One of the best places to go for lower interest rates on a used car loan is a credit union. Buying a used car may mean that you will have to put out some money on getting it repaired. You can avoid this hassle if you do some research on that particular model for reliability, says ConsumerReports.com. You can also avoid some of these problems if you buy a certified used car, or one that is new enough to be still under warranty. Be sure to have a mechanic look at it, too, before buying, because they can spot potential problems. The price at which any car is marked on a dealer’s lot is always going to be just a starting price. They will typically add between 10 to 15 percent more than what they expect it to go for, says ABCNews.com. This means that through haggling with the car salesman that you could come away with a much better deal, and be comfortable with the price once the car is yours. Remember that you can do this at more than one dealership, too, to get the absolute best price. You also want to be armed by knowing about the many other ways that a car salesman will try to trick you into paying more, once you are in the finance office. They will quickly try to add a lot of fees to regain their “loss,” but if you ask for a clear explanation, and are willing to say “no” a few times, you can still come out the winner and get the best price on a used car like you wanted in the first place.